Railpictures.ca - Gord Taylor photo, Dan Dell'Unto coll. Photo: Big M’s doing what they do best: smoke it up while hauling freight. CP M630 4569 leads C630M 4504, on what could be the London Pickup, possibly doing setoff work at Woodstock (the slide notes this as an eastbound train, but the power is facing westbound and coupled onto the caboose-end). This was taken from the now-removed Drew St. crossing, and the semaphore signals of Woodstock Station and adjacent lighting tower are visible in the background behind the train. The bulk of CP’s M630 fleet including 4569 were specially purchased for unit coal train service out west in 1969-70, partially due to CP’s dissatisfaction with their GMD SD40 fleet at the time, and partially because of some of the features MLW offered including a better wheelslip system and more robust traction motors. The M’s were separated into a few different number blocks depending on features (notably Locotrol Master, Locotrol Repeater, and pacesetter equipment. Some were also renumbered when features changed). However, their coal train reign only lasted a few years due to reliability isues arising and higher-than-anticipated maintenance costs. When GMD released their new and improved SD40-2 model, CP found it to their liking, and by the mid-70′s the big M’s were bumped out of coal service and sent east to be maintained out of St. Luc for general freight service, as evident in this photo. The earlier M’s like C630M 4504 were also assigned out west during this time for general freight service (they weren’t Locotrol equipped, so were often used as trailing or mid-train robot-controlled power on unit coal trains). The end came in the early 90′s when the last of CP’s big 6-axle MLW’s were retired. Some were unretired due to a power shortage in 1994, but re-retired a year later. The smaller 4-axle MLW’s including the C424′s and RS18u’s lasted a few years longer until the remaining units were retired in 1998. Gord Taylor photo, Dan Dell’Unto collection side. | Railpictures.ca – Canadian Railway Photography – photographie ferroviaire Canadienne. Caption: Big M's doing what they do best: smoke it up while hauling freight. CP M630 4569 leads C630M 4504, on what could be the London Pickup, possibly doing setoff work at Woodstock (the slide notes this as an eastbound train, but the power is facing westbound and coupled onto the caboose-end). This was taken from the now-removed Drew St. crossing, and the semaphore signals of Woodstock Station and adjacent lighting tower are visible in the background behind the train. The bulk of CP's M630 fleet including 4569 were specially purchased for unit coal train service out west in 1969-70, partially due to CP's dissatisfaction with their GMD SD40 fleet at the time, and partially because of some of the features MLW offered including a better wheelslip system and more robust traction motors. The M's were separated into a few different number blocks depending on features (notably Locotrol Master, Locotrol Repeater, and pacesetter equipment. Some were also renumbered when features changed). However, their coal train reign only lasted a few years due to reliability isues arising and higher-than-anticipated maintenance costs. 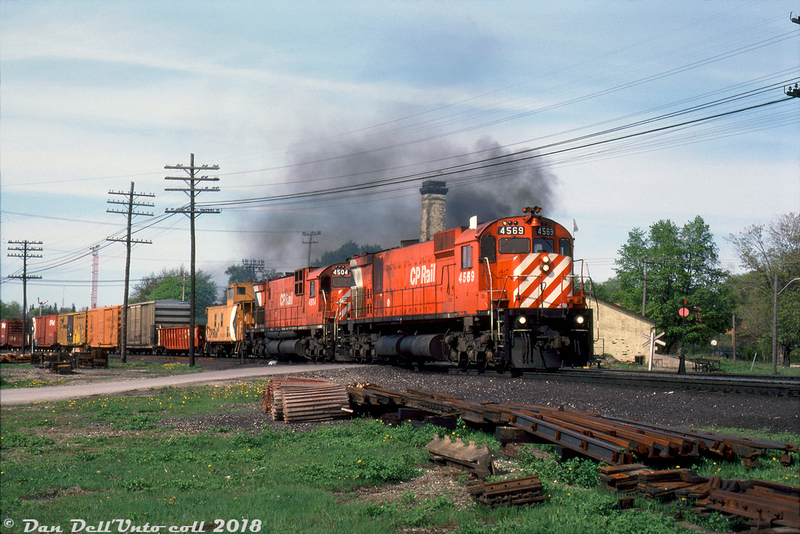 When GMD released their new and improved SD40-2 model, CP found it to their liking, and by the mid-70's the big M's were bumped out of coal service and sent east to be maintained out of St. Luc for general freight service, as evident in this photo. The earlier M's like C630M 4504 had also been assigned out west (while they weren't Locotrol equipped, they were often used as trailing or mid-train robot-controlled power on unit coal trains, as well as seeing normal freight use). The end came in the early 90's when the last of CP's big 6-axle MLW's were retired. Some were unretired due to a power shortage in 1994, but re-retired a year later. The smaller 4-axle MLW's including the C424's and RS18u's lasted a few years longer until the remaining units were retired in 1998. Gord Taylor photo, Dan Dell'Unto collection side.